Chickpeas. Oh, those little fellas that, after being soaked in water overnight, can be transformed into the best of dinners. Of course, I do not mean the ones in cans. Those are just to be kept for the hummus-of-the-desperate-evening when you have to come up with something edible and all you have is this can, a jar of tahini and some forgotten vegetables hanging around at the bottom of the refrigerator. But when it comes to actually cooking a hearty dinner, dried chickpeas are the only option. Because, not only do they soak up all the flavors they are cooked with, but, when they are properly baked, they can also be transformed into mushy, caramelized bits of deliciousness. When it comes to baking chickpeas, it goes without saying that you have to boil them first. And when we say boiling, we do not mean al dente. No. We mean boiled till they are easily mashed when pressed with the back of a fork. Then, on the stove, we create the base that will bring all the flavors together: caramelized fennel, lemon, onions, carrots and garlic. And two ladles of chickpea water to keep them nice and hydrated during the long baking process. After all, through this wonderful process you let the flavors happily blend in the oven while you sniff the air for the smells coming out of it. Find something else to do to help yourself forget them, because it is a long wait, totally worth it though. In a large pot, place the chickpeas and cover with cold water, 3 times this volume. Bring to a boil and let them boil till softened. They are ready when they are easily mashed when pressed with a fork. Boiling time may vary a lot depending the quality of the chickpeas. It may take anywhere from 45 min to 1 ½ hours. Add salt to the water after 30 minutes of boiling them. If you have a pressure cooker, go on and use it, it will save you lots of time. Leave chickpeas in the water while you prepare the vegetables. 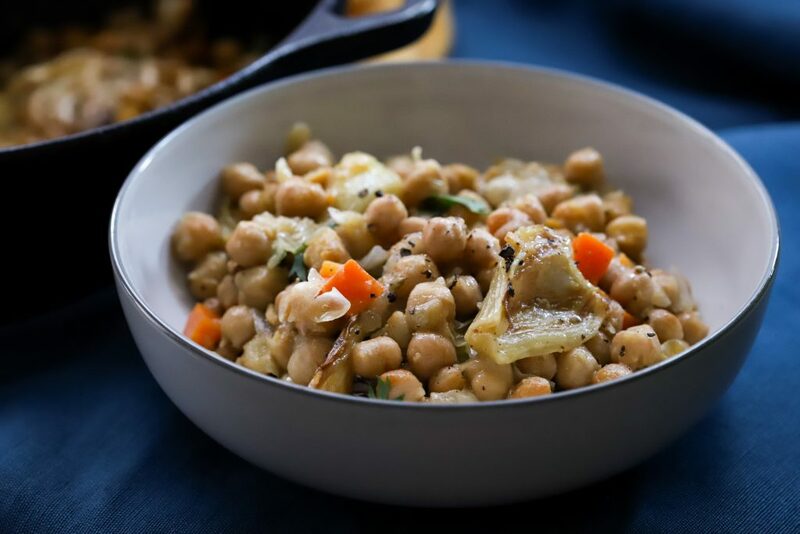 When the chickpeas are ready, put your empty casserole (Dutch Oven works best) in the oven and switch it to 200° C/400º F. We need the pot to be piping hot when we put everything in. Start preparing the vegetables. In a large shallow pan, pour the olive oil and warm to medium-high heat. Slice the fennel bulb into thick slices vertically. When the oil is hot, arrange the fennel slices on the pan on a single layer. Season with salt and pepper. Do not move them around, only check for caramelization after 5-6 minutes. When they start to take on a beautiful, brownish hue, flip them over and wait for another 5-6 minutes for the other side to brown. You do not need them to soften, this will be done in the oven. 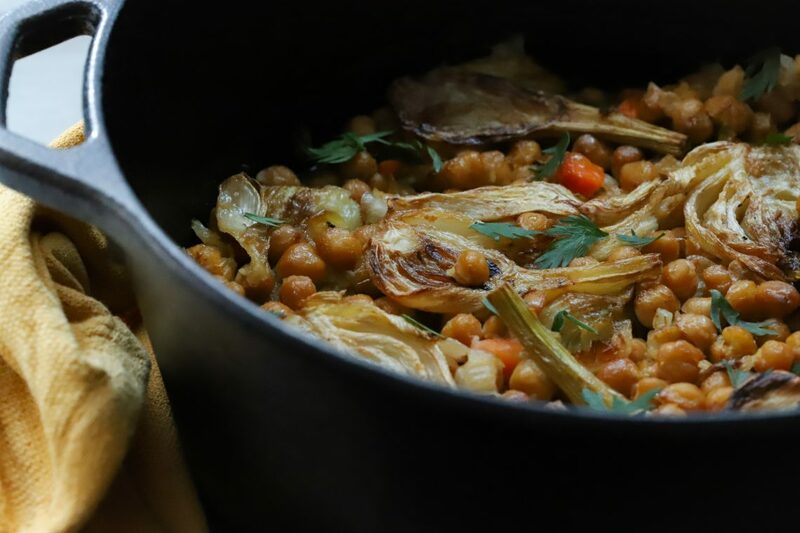 Without removing the oil from the pan, carefully remove the fennel and place it on a plate. If your broth is not warm, warm it up now. Measure 1 cup of brothand one cup of the water the chickpeas were boiled inand warm in a saucepan to have it ready. You should be left with a thin layer of olive oil in the pan. If not, add some more. Keep the pan away from the heat for a few minutes, you want the temperature to drop, or else the onions will brown and you do not want that. Lower the heat to medium. Put your pan back to the stove. When oil is ready, add the onions and carrots and cook for 8-10 minutes to soften, giving it a stir every so often. Keep an eye on it and lower the heat if the onions start to brown . Add garlic, give everything a stir, turn the heat to medium-high and continue cooking until fragrant for 1-2 minutes. In the same pan without removing it from the heat, add the chickpeas, broth and lemon juice. Stir well and taste the broth. It should have a pleasant and salty taste. If not, add some more salt. Don’t forget to add some pepper. Wait for everything to come to a boil. Remove the piping hot casserole from the oven, carefully remove the chickpeas from the pan and add them in. Then add all the water that is left in the pan. Take the fennel and place it on top, pressing some of it to nest into the chickpeas, and some to nest on top. Drizzle some extra olive oil and place the casserole in the oven. Bake uncovered for 45-60 minutes until the chickpeas caramelize on the edges of the pan, the juice bubbles and your kitchen smells like heaven. Let it for 1 hour to come to room temperature before eating. If you plan to eat it next day it is as amazing as the day it was made, just rewarm it and enjoy.